The center is open FREE OF ADMISSION CHARGE 9:00-5:00 Monday-Saturday. The center closes for weekday holidays observed by the County of Johnston; and we're usually closed on Saturdays following holidays that fall on Fridays, including the weekends of Easter and Thanksgiving. Our phone number is 919-934-2836. Our postal address is P.O. Box 2709, Smithfield, NC 27577. Our delivery address is 241 East Market Street. Our e-mail address is heritagecenter@johnstonnc.com. 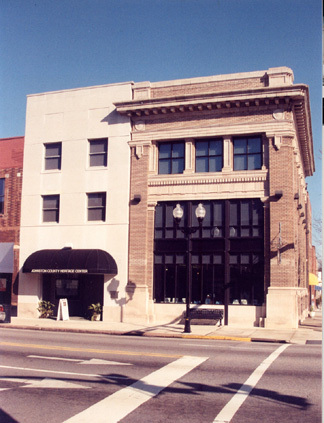 The Heritage Center stands on the northwest corner of Market (US 70 Business) and Third streets in Smithfield. Two-hour parking is allowed along adjacent streets. Free all-day parking is available in nearby off-street lots, the largest of which sits behind the Public Library on the east side of North Third Street. Click on the names below for e-mail links.